Installed as a web page on 27 Jun 2003. Latest update 10 Apr 2019. Text additions or changes are in bold. Parts 1 - 7 have been incorporated into a single file. *Visual equilibrium means that the amount of light (of stars) is proportional to amount of mass (number of stars). In 1940 Oort estimated (based on the Mass-to-light ratio of spiral nebulae) that 90% of the mass in the local group of spiral nebulae is "missing." Oort didn't cite Zwicky's 1933 paper (BSVD). A brief outline of most of the missing mass explanations, with links to internet sources of more in-depth information is provided. But then, the article will move on to what the author considers to be the real problems (and what to do about them). The basic outline for this section is derived from the articles Dark Matter versus MOND URL was http://www.astro.umd.edu/~ssm/mond/mondvsDM.html (DMVM), and What is the Missing Mass problem? Science Net - Physics (SNP). URL was at http://www.sciencenet.org.uk/database/Physics/Cosmology/p00717c.html. Other sources are identified as appropriate. This list is under construction. WIMPs (Weakly Interacting Massive Particles) (SNP) These move slowly. A distortion in the quantum vacuum energy leads to an additional "Bubble Force"
But.... the Hubble Space Telescope is taking pictures that are too clear. They show no evidence of the hazy effects that quantum foam should produce. Link to (MS1) was http://www.astro.umd.edu/~ssm/mond/mondvsDM.html. See the MOND section below. along the lines of fluid dynamics). MOND can be interpreted as either a modification of gravity through a change to the Poisson equation, or as a modification of inertia through a breaking of the equivalence of inertial and gravitational mass. (It's basically a mathematical exercise.) The modification occurs at very small accelerations. Stacy McGaugh, a proponent of MOND, says "MOND is difficult to test, and does not constitute a falsifiable theory." (MS1). With that in mind, we move on to new territory. Chandra observations of the hot gas halo of NGC 720 (a flattened gas distribution) is not consistent with the MOND predictions. Einstein's equations of GTR did not permit a static universe. The Universe must either be expanding or contracting. The de Sitter solution to the GTR equations predicted an expanding universe. * De Sitter is also the mathematician who almost buried the ideas of Einstein's biggest competitor on relativity theory, Swiss Physicist Walter Ritz. See: (SV87) The author happens to be a fan of Ritz's Newtonian-like electrodynamics, some of which can be seen at (RW08). The Friedman-Lemaitre Standard Cosmological Model (which came to be accepted as a fix to GTR) also predicts an expanding universe. Hubble's increasing redshifts for galaxies at greater and greater distances came to be interpreted as being evidence of the required expansion of the universe, and thus the Big Bang came to be the paradigm. Words inserted into these quotes, to clarify matters, are enclosed in [square brackets]. This procedure will be used in other quotations below. By 1920, the nature of spiral nebulae had become one of the major questions in astronomy. The National Academy of Sciences organized a Scale of the Universe debate on the topic between Harlow Shapley and Heber Curtis. Curtis wanted to restrict the diameter of the Milky Way to about 30,000 light-years, and championed the hypothesis of a large universe in which spiral nebulae were independent stellar systems, e.g., other island universes. appear fatal to such an interpretation." Here are some further thought provoking remarks that Curtis made with respect to spirals. in the Galaxy would explain why spiral nebulae aren't seen near the plane [of our galaxy]. the hypothesis that they are, in some unknown manner, repelled by the stars [in our galaxy]." "Why should this repulsion have invariably acted essentially at right angles to our galactic plane?" "Why have not some been repelled in the direction of our galactic plane?" universe theory must be definitely abandoned." between the two great groups of island universes." Here, he was getting close to admitting a Copernican problem, i.e., a special position for us in the universe. of the planetary nebulae, and five times that of the clusters." Adriaan van Maanen's monumental work on of spiral nebulae, as it stood in 1921, offers a long overlooked (read "rejected") solution to the flat rotational velocity curves for "galaxies." In the author's opinion, van Maanen's investigations have been wrongfully relegated to oblivion. Evidence will be presented below to hopefully help rectify the situation, and to commend van Maanen's findings as an already-accomplished solution to one half of the missing mass problem. From 1916 through 1927 van Maanen, who was a recognized authority on precision astronomical position measurements, produced twelve papers dealing with astrometrically determined internal motions of spiral nebulae. Shapley used his findings as ammunition in the great debate, but later on lost the faith in a groundswell of criticism directed at van Maanen's findings. See the tabular summary: Internal Proper Motions for M101, M33, M51 and M81. According to van Maanen, this motion of matter along the arms was river-like, i.e., gaseous and/or unresolved-stars spiraling outward in stream-like fashion. For each of the spirals he subtracted the average proper motion (in milliarcseconds per year) of the spiral from the measurements for individual data points to arrive at his rotational versus stream angular displacements. He divided his measured displacements by the number of years between photographs to obtain the annual rates for angular displacements. There is no direct information in van Maanen's 1921 paper (MA21) that identifies his estimated sizes of, or the distances to, the spirals, but if we assume, with Curtis, that the spirals should have similar tangential linear rotation speeds to our own, i.e., 320 km/sec at our location in the Milky Way disk, and use that speed to convert van Maanen's rotational periods to spiral diameters, we get the following results. These "starting point" spiral diameters are quite contrary to Curtis' idea for other island universes, where diameters on the order of 30,000 light-years were desired. That kind of information had to be available to his colleagues, and van Maanen's train was headed down the wrong track! The average of recent spectroscopic determinations of rotational velocities for the four objects in Table 1 is 178 km/sec. That's within a factor of two of the 320 km/sec starting point velocity used above. See Table 2. Table 3 shows how van Maanen's linear proper motions for a very limited sample of spirals and globular clusters compared to other astronomical objects. In their paper Internal Motions in Globular Clusters (KA00), King and Anderson report astrometric measurements of internal proper motions in globular cluster 47 Tucanae, using HST's WFPC2 camera with photographic epochs separated by two years. In 47 Tuc, the dispersion of internal proper motions has been found to be about 0.6 milli-arcsec/year in each coordinate. URL for (KA00) was http://arxiv.org/PS_cache/astro-ph/pdf/0007/0007028.pdf. Van Maanen's findings included the following. For the plates taken at the 25-foot focus of the Mt. Wilson 60-inch reflector, the mean [internal proper motion] tangential component for globular clusters M 13 and M2 was 3 milli-arcsecs/year, compared to the average for seven spirals of 18.4 milli-arcsecs/year. Comparing findings from 47 Tuc to those of M13 and M2 is not quite the same as comparing apples and oranges, but it does leave much to be desired. Even so, King and Anderson's 0.6 milli-arcsecond/year dispersion for 47 Tuc and van Maanen's 3 milli-arcsecond/year average tangential component for M13 and M2 are within a factor of ten-to-one of another. It might be worthwhile to bring HST's astrometric capabilities to bear on one or both of these latter objects. The proper motions of Quasi-Stellar Objects (QSOs) that the author has found so far, have mostly been attributed to gravitational lensing by intervening objects. It will be of interest to see if the gravitational lenses (which have to be moving in order to induce apparent QSO proper motions) move on, and let the QSOs return to their stationary outposts. The following comments are from van Maanen's 1921 paper. (MA21) Certain words or phases have been italicized or bolded for emphasis. increase of [rotational] motion with distance." Was 1970 a year for echoes - a' la flat galactic-rotation curves? of the nebulae as a whole." Those colleagues of van Maanen who were pushing for an expanding universe, were "unable" to repeat his findings. They dismissed his work as it being a case of his finding what he wanted to find. One of the primary, and often repeated, (and to this writer, fallacious) criticisms levied against van Maanen was that the precision of his measurements was smaller than normally encountered measurement errors. He was said to be reading positional variations much smaller than the sizes of the atmospherically blurred photographic images. References (BA02), (GK02), (IU), and (TV95) provide evidence of how his work was demeaned. URL for (BA02) was http://nchalada.org/archive/WaveLng21.html. Here's a quote from the first of the four references above. It is typical of the precision arguments made against van Maanen. The quote is taken from Andrew Bell's section on Suggested Discussion Topics (Part II) under the second sub heading of Achievable precision. The other three references are left to the reader. "By any standard, I think that Adriaan van Maanen's internal rotations* ought to have been set aside as unsupportable, right from the outset. All of his measured displacements corresponded to a half an arc-second or less between each pair of plates, and usually less than a quarter of an arc-second. Ignoring the fact that he claimed a hundredth of an arc-second as his measured measurement precision, I fail to understand how even a quarter of an arc second could be measured off photochemical plates from a ground-based telescope, then or now [c.f., Baade** (1963) at pp. 46-47, for a discussion of how difficult it was to achieve half arc-second photographic resolution, working in the mid-1930s]." * Strictly speaking, van Maanen reported on internal motions in spiral nebulae. These motions were not synonymous with rotations. See: Messier 81 Internal Motions. **Baade was one of van Maanen's detractors. van Maanen's critics err! Object image sizes are not the limiting factor regarding the precision in astrometrically locating salient points on astronomical plates, for example, the centroids of object images. 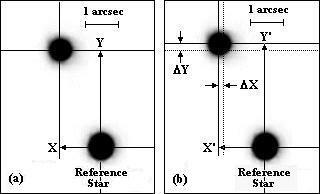 Figure 1 shows that position measurements can be made down to dimensions much less than the diameter of blurred stellar images. Figure 1a represents a section of an early photographic image, and Figure 1b represents the image taken a suitable number of years later. It should be obvious that delta X and delta Y can be much smaller than the atmospherically blurred diameters of the stellar images. See: On Spiral Nebulae, van Maanen et al.. There are unresolved differences of opinion about the results of Knut Lundmark's re-reading of van Maanen's plates for M33. Listed here are two quotes from recent critics of van Maanen's "rotations." proper motions was less than 1/10 as large as those van Maanen had measured." many other astronomers to notice." The following table shows a comparison of van Maanen and Lundmark's measurements of motions in M33. Table added 26 Oct 2003. Readers may read Lundmark's obscure 1926 report (LK26) in the Astrophysical Journal. Hubble's Demolition of van Maanen? Michael Hoskin summarizes the warfare between Hubble and van Mannen (HM97). He says: "The van Maanen problem became acute as the Dutchman pointedly persevered with his comparisons of pairs of photographs of spirals, concluding in every case that the nebula was rotating at a speed that made it physically impossible for it to be an island universe." The author would hope that Hoskin's purpose was to encourage readers to read the papers for themselves, because although what he says about the papers is true, may be misleading. Hoskin makes it sound as though Hubble demolished van Maanen's findings and that van Maanen's new tests put him in his proper place. That's not quite like it was! This writer has not had opportunity to do a good literature search to compare current findings on spiral nebula rotations, compared to those reported by van Maanen, but is of the opinion that the findings will match up just fine. If they do, then the constant rotation curves for spiral nebulae, a.k.a. "galaxies" can most likely be explained in terms of plasma dynamics. But What About Hubble's Redshifts? "Instead of immediately recognizing this as a problem, the mainstream adopted these configurations, calling them the "fingers of God." (GJ) This effect is sometimes called a redshift-space distortion. Louis Desroches says it this way. "Two important effects occur in redshift space. Although redshift corresponds to true distance according to the Hubble Law, small peculiar velocities not associated with the Hubble flow can cause distortions in redshift space. The most evident of these is the Fingers-of-God effect, where long thin filaments in redshift space point directly back at [an] observer. We should know by now that we are not privileged observers, this effect must be unphysical." (DL). URL for (DL) was http://astron.berkeley.edu/~louis/astro228/redshift.html. In 1938 Hubble (HE38) wrestled with two viewpoints on the origin of cosmological redshifts. The first was that the universe (the small part of it that we could see) was stationary and homogenous and the redshift-distance relation was linear, however we did not know the non-Doppler cause of the observed redshifts. The second viewpoint was that the universe was expanding (the spiral nebulae were receding from us) but that the distribution of matter was no longer uniform (the density increases outward), and the law of red shifts is no longer linear (redshifts increase with distance at an accelerated rate). Regardless of the manner of how light gets cosmologically redshifted, the redshift, as currently understood, is tied to the unverifiable assumption that the unit electrical charge (the charge associated with electrons and protons) is a space-and-time constant, even in the remotest parts of space and at the longest times ago. In 1988 the author published a (non-mathematical) hypothesis (FR88) that electrical charge is not constant, rather that it is a matter-density-dependent variable. A "GIGO" function for the absorption-driven emission of force carrying particles, positive and negative charglets, in the author's ... Emission-Absorption-Scattering sub-quantum physics model (FR93), provides a theoretical framework, which allows (demands) charge to be a material density dependent variable. "Ambient matter density" as used above, is related to the total mass in a volume of space on the order of one cubic light year or less. The author's variable electrical charge hypothesis for explaining anomalous redshifts is similar to the Narlikar-Das Variable Mass Hypothesis (VMH), based on the Hoyle-Narlikar theory of gravitation. Arp has incorporated the latter approach in his reasonings on anomalous quasar redshifts. See: (ND80), (AH98), and (NV02). Figure 5 shows a "Milky Way" Cosmos. In 5a a density profile line is shown piercing a globular cluster, a spiral nebula, and the Milky Way galactic disk. A density plot, along the profile line, is shown in 5b. The Solar System is located near the peak for the galactic disk. It may be that the lengths of the orbital radii R and r will also be functions of G.
If the spirals are clustered near the galactic plane then there is no requirement for missing mass to make them behave the way we want them to. We should learn to accept their behavior as it is, and adjust our theoretical outlooks so as to conform to the way the universe is. Cosmological redshift may turn out to not be a measure of an expanding universe. If so, according to the variable electric charge model, it can be used as a measure of density differences between our observing vantage point and the remote objects observed. Galaxy clusters should at least become short, stubby fingers of God. DP00 - Durrell, Patrick R., Ciardullo, Robin, Laychak, Marry Beth, Jacoby, George H., Feldmeier, John J., and Moody, Ken, Kinematics of M33's Disc Planetary Nebulae - Figure 4: The 'smoothed' rotation curve derived from the PNe velocities compared to the HI curve from Corbelli & Salucci, (2000). (Curves very similar.) Radial velocities obtained for 142 planetary nebulae. HB92 - Hetherington, N., Brashear, R., Journal for the History of Astronomy, 23, 53-56 (1992). MA30 - Maanen, Adriaan van, - Investigations on Proper Motion - Sixteenth Paper: The Proper Motion of Messier 51, MGC 5194. Contributions from the Mount Wilson Solar Observatory, 408, 311-314 (1930). URL was: http://www1.msfc.nasa.gov/NEWSROOM/news/releases/2002/02-264.html (Part 2) This article is probably archived. Haven't located it yet. NRV - Nieuwenhove, Rudi van, Is the missing mass really missing? - [Added 06 August 2003.] - Thanks to John M. Fritzius of Arnold Missouri for the link. SC21 - Harlow Shapley & Heber D. Curtis - The Scale of the Universe, NRC Transcripts of the "Great Debate" Bulletin of the National Research Council, Volume 2, Part 3, Number 11, pp 171-217 (May 1921). SNP - ScienceNet - Physics - What is the Missing Mass problem?